The Westmead Education and Conference Centre (WECC) hoarding on level 2 was removed over the weekend, revealing the refurbished level 1 teaching and learning space. Staff can now get a bird’s eye view of the new space (peering down from level 2! ), before it is soon handed over to the LHD and the University of Sydney this week. The new WECC space, looking down from level 2. “The removal of the level 2 hoarding is an exciting time for the redevelopment team, as it gives staff, patients and visitors the first opportunity to see the progress we’ve made in the WECC,” Helen Abouyanni said. After handover, the University of Sydney will begin commissioning the IT and AV facilities. Members of the Westmead Hospital executive and education, training and research committee walked through the new space last week. 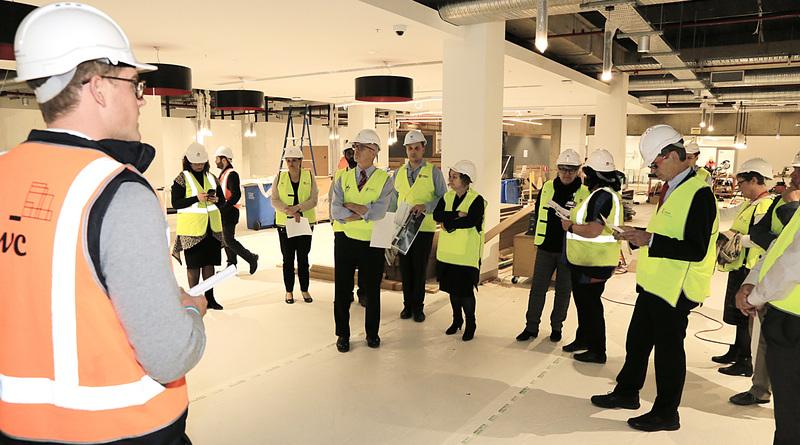 Westmead Hospital’s executive got a sneak peek at the new WECC space last week. Westmead Hospital’s Prof Peter Landau views the new WECC space. “The WECC level 1 project is the first major upgrade of shared education, training and research spaces for Westmead Hospital,” Ms Abouyanni said. Westmead Hospital general manager Andrew Newton views the new WECC space. Westmead Hospital executive staffers get a glimpse of the new WECC. The Westmead Education and Conference Centre will open in early September for all students and staff engaged in education, training and research activities.